Soaking tired limbs in the beautiful clear water of the Liard Hot Springs was a fantastic tonic and did wonders for our tired, dirty bodies. After a good night's sleep we packed up and headed south along the Alaska Highway towards our destination for the day, Toad River Campground. The day promised some climbing over a couple of passes as we had now crossed, once again into the Rockies. We weren't expecting anything horrendous and our bodies are pretty well honed now so it's just about doing the time to get up them. The road took us past Muncho Lake and at one point, as we looked back the blue of the water with the float planes and stunning sky made us both think of the Caribbean but I'm sure the water would not have been so pleasantly warm. Carrying on a little further we stopped for lunch at Strawberry Flats and got some fuel on board to tackle the first pass of the day. Going down a couple of gears and chatting, we reached the summit with much less effort than expected and enjoyed the long downhill into the valley. The scenery changed and we entered into sub-alpine. A few trees but mainly dusty rock surrounded us and we were flanked on both sides by rocky mountains. Along the road side we spotted two goats that bounded up the cliff side and just after our second pass of the day we spotted a moose just chomping away in the grass. This second pass again is hardly worth a mention but again the scenery changed once we came down and we followed a fast flowing river turned milky blue from glacier melt water. This valley closed in around us and the peaks rose up sharply from the road, it really felt like we had entered the Rockies once again. We carried on following the river until we came to our destination for the evening, Toad River Lodge Campground. At a whopping $32 not including tax we were fairly stumped at the price but after a long day we didn't want to have to find a wild place to set up a tent and there was WiFi and showers so, with some reluctance, we paid the bill. The cost of the camping wasn't the only shock of the day. This was also the day that Sophie's pink bag had finally departed this earth and was no longer fulfilling it's one and only duty. So, with a heavy heart, we said farewell to Pink Bag, he will be remembered in our hearts and our photos. The next morning had us one the road slightly later than we would have liked but set off we did only to bump into four cycle tourists from Florida. They were heading up to Prudhoe Bay and had set off only a couple of days before we had on the 25th February. One of their group was also sporting a 4 month beard which, Sophie likes to point out, was almost exactly the same as mine. They gave us two helpful pieces of advice: 1) Get the cinnamon buns at Tetsa they are amazing and 2) go to the breakfast buffet at the Fort Nelson Hotel. We tried to give them advice but could only suggest not staying at Toad River. After saying goodbye to Keys to Freeze we checked the map about both suggestions. Tetsa was a shoe-in, no worries there. We would go past it just before another pass, it would give us the energy to get to the top. Fort Nelson was more of an issue. We couldn't get there today, it was too far, but if we carried on on our normal distances we wouldn't be there for breakfast but it wasn't worth staying an extra night just for breakfast. So a challenge was set to get to within striking distance of Fort Nelson today (we wanted to get to within 30 miles) and get up early and get to breakfast before carrying on further south. The ride to the cinnamon buns was gently up and down and caused no concerns and we got there at the heat of the day. We ordered two bundles of joy, the first to eat for the fuel for the pass we had coming and the second for pudding when we found a place to stay. Oh my were they tasty! We both wanted to eat the second one straight away but we did save it for later. We talked to a couple of motorcyclists and they were surprised we were heading south to tackle the pass. But we weren't worried, if it was anything like the other "passes" then we would be fine. They said their goodbyes and added 'well better you than me'. Steamboat Pass is a proper mountain pass. We climbed for 90 minutes and it had some steep sections, plus it had false summits. But we summited the beast and we had a granola bar at the top and headed off down the other side. With still 20 miles to do before we started looking for a place to camp we had some cycling to do, but it was all down hill so all was fine and dandy. Bees panic when travelling at 30mph while trapped in leg hair. When they panic they lash out with their sting and stab anything they can find. I panic when a bee is stinging me while travelling down a mountain at 30mph. I panicked down Big Sur when it happened the first time and I panicked again down Steamboat Mountain Pass. After getting rid of the bee and removing the sting we carried on down. 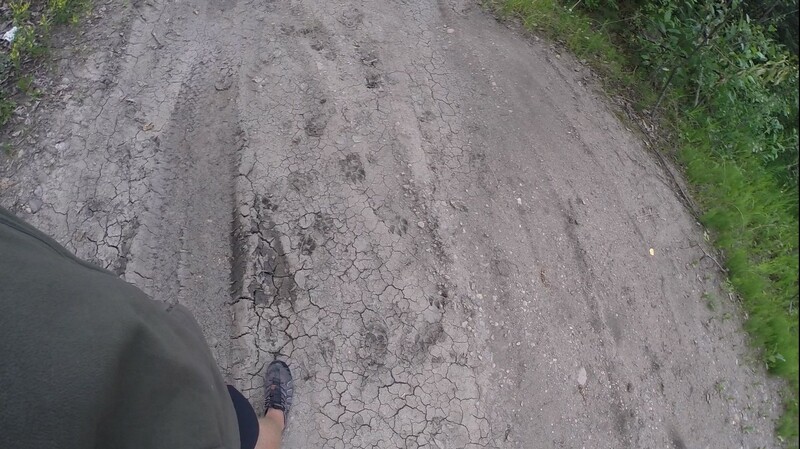 After a couple more miles the CamelBak we use for extra water decided to take a dive into the road and rip meaning that we had to decant the water into the empty bottles before we lost it all. Once this was done we again headed out to start our search for a suitable wild camp site. This is when we again noticed the lack of suitable trees to hang food from as Sophie has already mentioned and no sign of a litter barrel either. So we carried on and finally we found a water monitoring station to set up camp and hide our food. We ate our dinner quickly, noticed some tracks in the dirt but we were too tired to move on so just set up the tent and crashed out. In the morning we were up early to get to Fort Nelson for the breakfast. We raced the 30 miles into town and arrived at 8:15. We found the place and started eating the eggs, bacon, hash browns and sausage on offer. The buffet closed at 9:00 but we had three goes at the food and were stuffed well before the close. It was a very different way to start the day but it was starting to feel like we were getting back into civilization so we headed to the Tourist Information to get some free WiFi and check out our options for heading south.